We’ve got excellent news for all the shopaholic out there. You can now arrive at or leave from Docks Bruxsel behind the wheel of our BMW of MINI. FREE parking spots are now available at the entrance of Docks Bruxsel. It has never been easier to do your shopping with DriveNow! Where are the DriveNow parking? 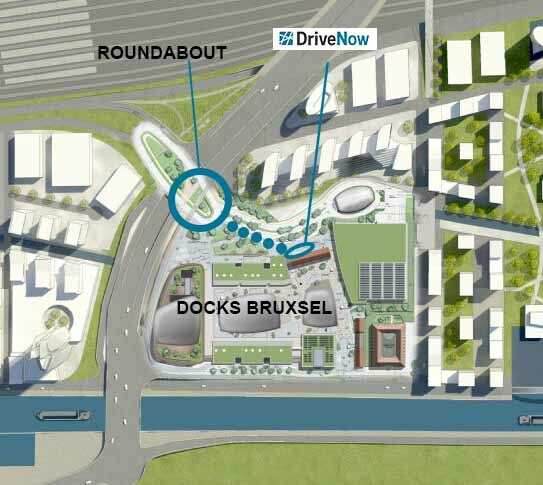 The DriveNow parking spots are located on the right-hand side after the roundabout, before the Indigo underground parking. There are 3 parking spots available and it is possible for our customers to end their rental there. What happens if the parking spots are already taken by other DriveNow cars? If no parking spots are available, you can also park your DriveNow in the surrounding streets inside the DriveNow Zone. Just look at the map in the app! DriveNow doesn’t have any parking spots in the Indigo underground garage, therefore it is not possible to end your rental there. If you have a MyDocks card, you can park your car in the Indigo Underground parking for free for 2 hours. However, please note that you will have to pay the DriveNow parking minute fee of 19 ct per minute and bring the car to the DriveNow Zone to end the rental. You don’t have a MyDocks card? Simply ask your free card at Docks’ Welcome Desk!